Last month I read All Your Worth: The Ultimate Lifetime Money Plan by Elizabeth Warren and Amelia Warren Tyagi (affiliate link – thanks for using!). The authors have another very interesting book titled The Two-Income Trap that I have skimmed and am now more interested in reading in full. You may recognize Elizabeth Warren’s name because she was the deputy director of the new federal agency spearheading consumer finance protection until last summer. I really, really like All Your Worth (AYW) in outline. If you boil it down to its key principles, I employ and believe in all of them. In the details and specifics of the authors’ implementation of the principles I don’t always agree, but the book was still a very valuable read for me. In this post I’ll discuss a few of the things that jumped out to me, beginning with the overall principle of the book. The big take-home point of AYW is the suggestion of a net income allocation of 50% to “must-haves,” 30% to “wants,” and 20% to savings. With exceptions for special temporary life circumstances, they say that each household should adhere to this allocation for a sustainable, enjoyable, and secure financial life. I agree of course with the importance of savings and that, as they say in chapter 4, “if you can’t afford fun, you can’t afford your life.” However I wasn’t sure about the 50/30/20 breakdown. I was happy with the allocation we had going on and wasn’t sure how I would feel if it didn’t match up with this suggestion. Luckily or strangely enough though, our allocation almost perfectly matches the balanced money formula (with two caveats, discussed below) – within 1% of each! This gives me more confidence in their formula because we have come to a similar conclusion by trial and error. In the first chapter, the authors take you through categorizing everything in your budget into must-haves, wants, and savings so that you can see where you are in comparison with the balanced money formula. When I did this the first time, I saw that our must-haves were around 60% (high in the Danger Zone) and our wants and savings were too low! I didn’t really feel that we were overextended in our must-haves so I took a more careful look at their criteria for an expense being a must-have and I realized that the “problem” was our tithe/giving. While I consider tithing a non-negotiable, it doesn’t technically fit in as a must-have because it is not something we would do if we lost our income (guideline 2). But it’s certainly not a want or savings either. I decided to excluding our giving percentage from our “take-home” income, the same way that the authors exclude taxes, and that was when our budget snapped perfectly in line with the Balanced Money Formula. I finished reading the book, of course, and also scoured the index, and the authors don’t discuss the role of giving in a household’s lifetime financial plan. This seemed very strange to me. Many Americans, not just Christians and other religious adherents, give a noticeable percentage of their incomes. Yet they don’t address it at all. I have observed this same problem in just about every personal finance book I’ve read that is not written specifically for a Christian audience. It makes me wonder sometimes if (PF authors think) it’s impossible to effectively grow wealth while giving away 10%+. When I say that we save the 20% (post-tax, remember) recommended by the book, I’m speaking only about our retirement accounts, because those are our only long-term savings vehicles at the moment. 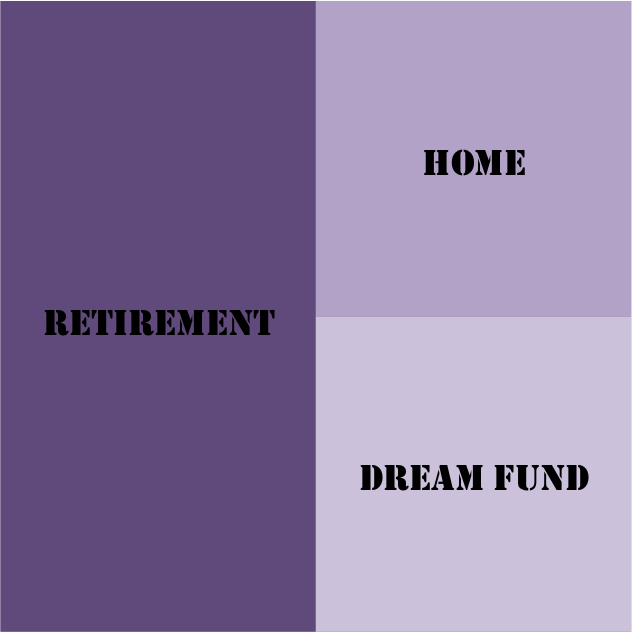 The authors, however, recommend a Savings breakdown of half toward retirement, a quarter toward accelerated mortgage payments, and a quarter toward dream funds. I actually think that this is not aggressive enough for retirement savings. More recent PF literature than this recommends saving at least 15% of gross pay toward retirement, so that would be close to the 20% net recommended by AYW. I also would not really consider the “dream” funds savings. I mean, they technically are savings, but they’re not for living expenses or emergencies. Dream funds I would consider a subset of wants, like I consider our Travel account a “want”, even though it is a “savings” account. But this is a much more minor quibble than the percentage toward retirement, in my mind. I suppose if we were following this formula exactly we would not be paying off our mortgage with that 5% but rather saving for a down payment for a home – not something we’re pursuing right now but a good suggestion/framework. The important point is that people pay off debt (the first step before wealth-building) and then save a good percentage of their incomes. In The Lifetime Savings Plan, we have accomplished Stage 1 ($1000 emergency fund) and Stage 2 (well, we didn’t have steal-from-tomorrow debt to begin with) but have skipped over Stage 3 (6-month emergency fund) in favor of stage 4.1 (saving for retirement) and sort of participating in stage 4.3 (dream funds) if these dreams are short-term rather than long-term. As you may have expected from Elizabeth Warren’s advocacy for the consumer protection finance bureau, AYW is very anti-credit card. Like, don’t-even-use-a-debit-card anti-credit card. I totally get that credit cards are a dangerous tool – like a chainsaw, if used improperly they can hurt you real bad. However, if used properly, they make your life a lot easier and can even enhance it. I’m going to quote a few sections from pages 116-120 of AYW to provide direct responses about my experience with credit cards. I’m certainly not advocating that everyone use them, but just giving examples of how an above average user can avoid the traps set by the companies. By using credit cards, it becomes almost impossible for anyone to keep track of total spending. Unless you pull out a notebook and calculator every time you lay down a credit card, you will always be a little vague on how much you spent… Credit cards also make keeping track of what you’ve spent very, very complicated. Even if you don’t regularly overspend, those cards make your financial life more complex and a lot more stressful. Credit card spending is invisible, so you have to keep a running tally on your own (or just wait and pray). Credit cards always leave you guessing whether you have enough or whether you are already in the hole. On the contrary, I find it more difficult to keep track of cash spending. AYW was published in 2005 and I didn’t have a credit card back then, so I’m not sure how much has changed with online banking in the last six years. I get the impression from this passage that the authors had to wait for their monthly statements to arrive in the mail to know exactly what they charged. However, my credit card generally updates my account online within minutes of my making a purchase and I have access to it 24/7. I log on to Mint daily (who am I kidding? multiple times daily.) to see where we are in relation to our monthly budget in each of our categories. Electronic records take the guesswork out of tracking almost completely. (But can’t you just keep and check your receipts either way?) With cash, I have to manually log each purchase that I make, which I might not do for hours after it occurs or even days when we’re on vacation. I believe my tracking is much more accurate and up-to-the-minute because we use plastic over cash. Credit cards are also ridiculously, unbelievably expensive. Anyone who is working hard to get her money in balance has no business wasting money on these cards. Annual fees? Late fees? Interest charges? Just to spend your own money! That’s not smart! I don’t pay an annual fee and I’ve never incurred late fees or interest charges on any of our cards. I literally have used them perfectly in this regard. Never spent a dime, only received rewards. Good for you, but that doesn’t mean you’ll never pay extra money to your credit card company. And here’s why: The credit card companies count on the fact that even people like you make mistakes… The credit card company makes its profits when you mess up and then pay them for it. Well, in 4.5 years I’ve never made a mistake, so I think that’s a pretty good track record. We have auto-payment set up to transfer over our balance if we do happen to forget to pay it in advance. Plus we have our emergency fund, and if we had some catastrophe come up we just wouldn’t use the cards. We know how dangerous credit card debt is. Thanks to Elizabeth Warren, the crazy fees that credit cards used to be able to charge have been somewhat curtailed. And I am grateful to her for that. The credit card companies definitely make money off me by charging merchants fees to use plastic – not by charging me fees directly. This isn’t even going into the benefits credit cards offer and the cash rewards that we generate! The only really legitimate argument I’ve ever heard for favoring cash over credit or debit are the studies that show that people tend to spend more money when paying with plastic over cash – basically that we feel more pain when handing over cash and are more inclined to limit our bill. The only place I think that applies for me is in the grocery store, honestly – and that’s why we have a grocery budget. I know what our limits are. What did you think of All Your Worth? Do you follow the Balanced Money Formula? How do giving, saving, and credit cards fit into your life? 7 Responses to "Book Review and Application: All Your Worth"